Peak Period Rates (1st July to 15th September) will surcharge RM20 per person. *Child Rate is refer to chilren between age 3 to 10 years old. *Child rate is valid if sharing with at least 2 adult in one room without extra bed. *Child who share with 1 adult in one room will be considered as adult. 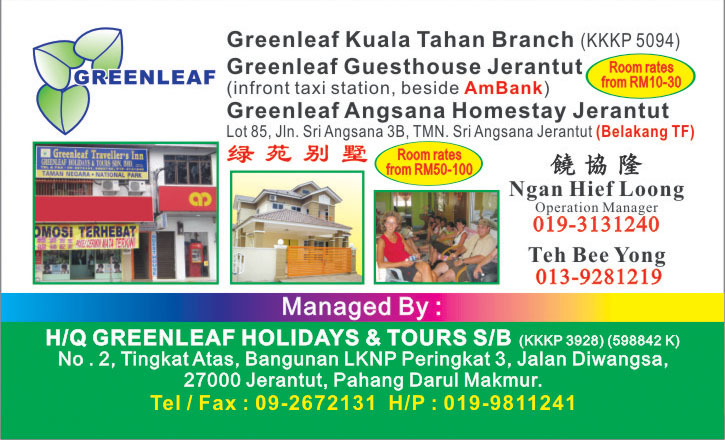 01:00pm Depart from Jerantut to Kuala Tahan, The Park's headquarters by drive own vehicles. 03:30pm Experience 45 minutes Shooting 7 sets of the rapids to Kuala Trenggan. You must be prepared to get drenched! / Swimming at river side at Nusa Camp. or *optional. 05:30pm Boat to Aborigine Village to visit Orang Asli with natural habitat. *Donation to Orang Asli RM5 per Person. Own expenses. 09:00pm Experience night jungle walk with nature guide and visit Tahan Hide and see the nocturnal animals come alive! Bring along torch light. 09:00am Jungle trek to Teresek Hill (344m). From the hilltop and in clear sky you maybe able to see the peak of Gunung Tahan. The trail is passing on one of the best bird watching habitats area and can hear melodious song of hornbills. 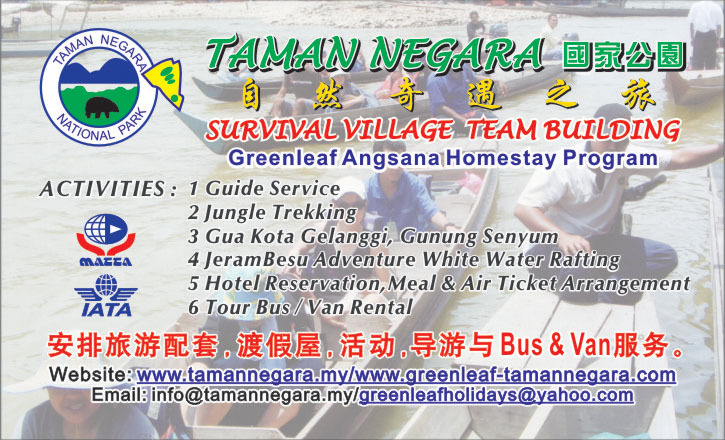 02:00pm Check out & Leave Taman Negara. Bye Bye! Boat ride to Lata Berkoh Cascades (waterfall) along the protected Tahan River. Enjoy the cool, refreshing air, and the natural beauty of rainforest along the ride. On the way back, visit the Kelah Fish Sanctuary. Feed the fishes and come in close contact with them(Visiting the Sanctuary is subjected to permission from the local authority and river condition). 乘搭无篷舢舨去国家公园著名的大汉河,拉达柏谷瀑布4人一小船,露 天浴场.途中可见到Monitor Lizard, River Otter, Eagle, Hornbill, 五颜六色的天然岩石,清澈见低, 沐浴在热带雨林里的乐趣!可触摸红积罗鱼(ikan kelah),观看多达28种珍贵的淡水鱼.在途中享受风光明媚的国家公园原貌. √ Camera / Video Cam licenses (RM5 per Camera) and Entry Permit. / Above itinerary subjected to the weather & local condition. √ Things to Bring: T-shirt, Short, Torch light, Sport Shoe, Slipper or Sandal, Toilettries, Drinking water, Swimming Suit, Rucksack, Poncho, insect repellent. √ Donation RM5 to Orang Asli. *Note: Interchange from Jerantut Station to Taman Negara another 64km.